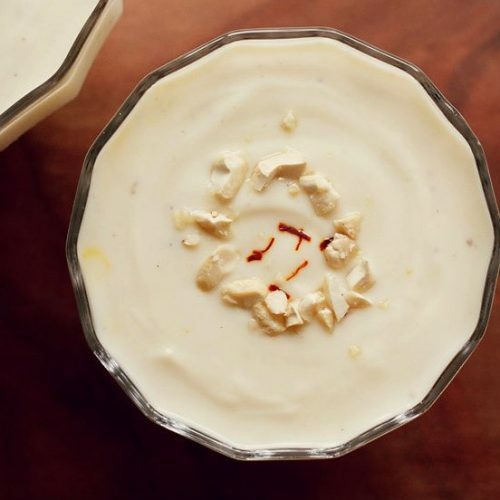 shrikhand is a thick, creamy indian dessert made with hung curd. in a small bowl, take 1/2 to 1 tbsp milk and warm it on a stove top or in a microwave. add a pinch of saffron strands. stir and keep aside. then in a mixing bowl take 1.5 cups chilled greek yogurt (about 400 grams). add 1/3 cup fine sugar. i used unrefined organic cane sugar. you can also add powdered sugar instead. add sugar as per taste. first add 1/3 cup and if required you can add 1 to 2 tablespoon more. for a more sweet taste, you can add 1/2 cup sugar. with a wired whisk and with brisk round movements, mix the sugar with the yogurt, as well as beat the yogurt till it becomes smooth and without any tiny yogurt granules. you should get a smooth, creamy consistency in the yogurt. now add the saffron soaked milk and 1/4 tsp cardamom powder and 2 to 3 pinches of nutmeg powder. cover the shrikhand bowl and refrigerate for 30 minutes to a couple of hours. you can also keep overnight or for a couple of days. while serving, sprinkle some sliced or chopped dry fruits (almonds, cashews, pistachios, chironji) and 2 to 3 saffron strands (optional). i used chopped cashews for garnish. serve this greek yogurt shrikhand plain as a dessert or accompanied with pooris or chapatis.